The Bulungula Incubator has invested much time and resources in building classrooms to house the local government primary school. However, we are deeply disappointed by the fact that the quality of education within these new classrooms remains exceptionally poor. The school has no principal and the teaching staff are frequently absent (in fact, some of the staff have been absent more days than they have been present over the past six months). It is totally unacceptable that the children of Nqileni are being denied their right to a quality education. We have renewed our efforts to address this education crisis – especially because the children from our Grade R class will be moving to Grade 1 at No-ofisi in the new year. The quality of education that the preschool children are getting at Jujurha far exceeds the quality of education they will receive at No-ofisi. In fact, our Grade R children are demonstrating numeracy and literacy skills that are more advanced than many of the Grade 1 and 2 learners at No-ofisi. 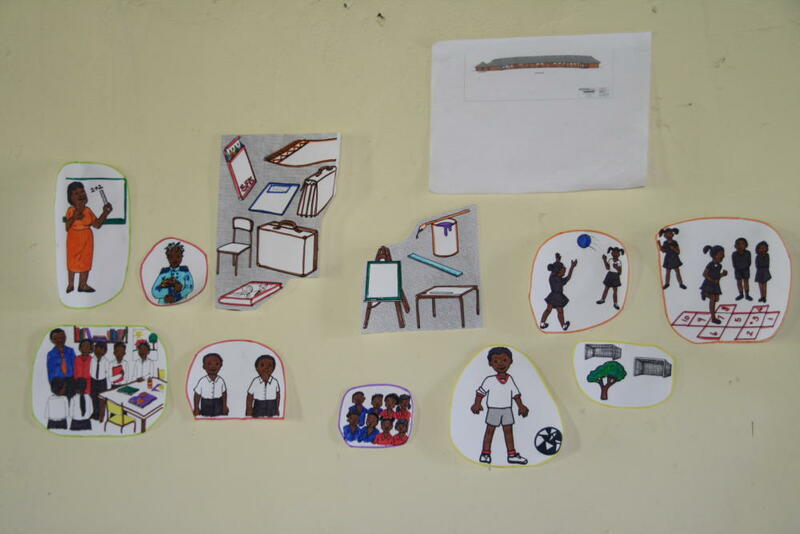 As part of our efforts to support No-ofisi, we have been facilitating weekly workshops with the school governing body. 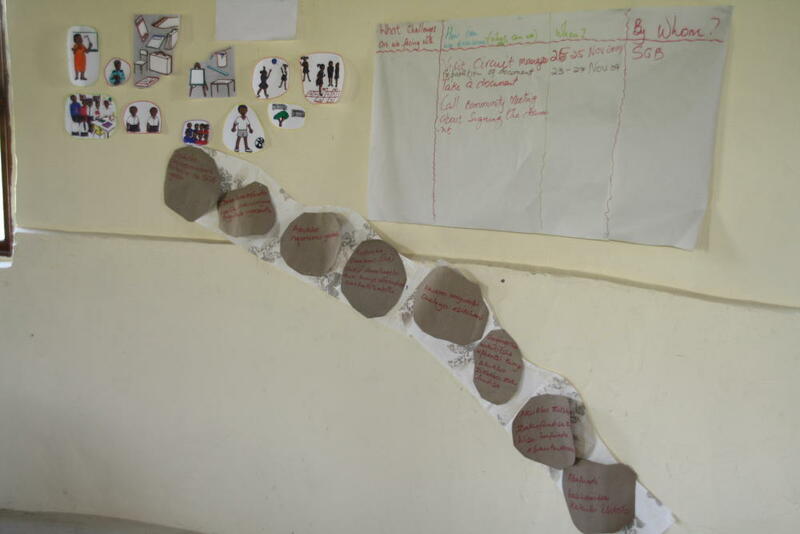 The workshops began with a visioning process – painting a picture of what we want No-ofisi to look like by the end of 2010. We then identified the various challenges (the “boulders in the road”) to getting to our destination. We are systematically working our way through these. The road has already been a long one – members of the SGB have recorded their efforts to address the crisis at the school and many of these efforts date back to 2005! It is difficult for the SGB to remain motivated when they have had so little success in their efforts with the teachers, the acting principal and the district office. In their latest attempt (a week ago) to get support from the circuit manager, the SGB travelled 2 hours to the district office, waited outside the office for 4 hours (constantly being told that the circuit manager was ‘about to arrive’) and then travelled two hours home, having been unsuccessful in meeting the circuit manager. They did however leave behind a letter detailing their concerns and requesting urgent intervention. If they do not get a response from the circuit manager, the same letter will be forwarded to the regional manager and, if necessary, beyond…. The delivery of a decent standard of education in this remote rural village is long overdue. The Jujurha Early Learning Centre has provided the community with an experience of quality education, and parents are now rightfully demanding this level of quality from No-ofisi. I’m so inspired by your latest newsletter, and hope to meet you in Jan / Feb during a trip to South Africa, but to read this report about the struggles of the SGB at No Ofisi is so frustrating and must be so disheartening for you all. I just wondered (not knowing the SA education system) if you have an option for No Ofisi to become an independent school but still be in receipt of the same budget from central / regional government as a government school? It’s a model we have in the UK, and the independent schools seem to get better results and more effective spending – it also works out cheaper for the government as they’re not having to do so much budgetary or management over-seeing, but the school still has to follow all the requirements of a government school. If this were an option it seems like you guys have the talent and the commitment to make a real go of an independent school – and it would be a much more rewarding use of your time & effort than trying to get the government officials to bother meeting with you. Best of luck, and well done for everything you’ve achieved so far. I bought Bululgula shares for all my family for Christmas in 2008 and have loved following your progress. You get the letter and the details of all your efforts to President Zuma’s hotline and see if this helps. Do keep me informed. You could also send the letter and details to the Deputy Minister of Basic Education, MinisterEnver Surty.